Join over 32,000 international students from more than 34 countries who choose Cairns each year as their destination of choice for world class education surrounded by World Heritage attractions. Study Cairns is the leading education, training and tourism network representing organisations, institutions and businesses in Cairns and support visiting students. Choose to study in Cairns and you will live in an education-focused city that offers a personal and welcoming experience in a safe and clean environment. You will experience quality education, friendly people, an agreeable climate surrounded by World Heritage listed icons the Great Barrier Reef and the Daintree Rainforest in the Wet Tropics, the world’s oldest rainforest. There are many reasons that Cairns is the destination of choice attracting more than 32,000 international students from over 34 countries each year as well as domestic students choosing to study away from their home base in Australia. With a population of 160,000 residents Cairns is a vibrant and exciting place to live and study, offering a safe, friendly and affordable lifestyle. Cairns CBD sits on the waterfront with the Coral Sea, Great Barrier Reef and islands to the east and rainforest clad Wet Tropics mountains to the west. The city itself is an attractive destination attracting almost 2.5 million visitors each year. Our community welcomes student visitors and many local families open their homes to students on short and longer-term stays. 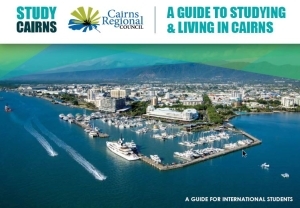 For students who choose to live independently, Cairns offers a great variety of affordable housing options close to the beaches and city centre, and an excellent network of cycling and walking paths. Cairns offers a perfect balance of excellent educational facilities, a stunning climate, pollution-free environment and friendly hospitality. Reports indicate that the cost of living in Cairns is 22% cheaper than in Sydney (data compiled by Expatistan Nov 2017). Part-time employment opportunities combined with lower accommodation and living costs makes Cairns an attractive destination to study for self-funded students. Part-time employment helps to sustain fees and living expenses, and provides an opportunity to interact with other Australians. Cairns is a multicultural friendly society with a big heart comprising 160,000 people from many nations. The city embraces more than 2.4m visitors from across the globe each year. It is a progressive modern city that thrives in a tropical climate; an extensive range of public and sporting facilities, cultural precincts and annual events. Cairns Regional Council holds an annual Cairns Multicultural Month to showcase and celebrate the city’s unique cultural identity, promoting awareness of multiculturalism and the benefits of living in a culturally diverse community. With a modern domestic and international airport, Cairns is in close proximity to Asia and the Pacific with a convenient flight network. Cairns International Airport has scheduled flights connecting Cairns to the city hubs of Hong Kong, Singapore, Tokyo, Osaka, Port Moresby, Shanghai, Guangzhou, Auckland, Bali, Manila and Seoul. Cairns Domestic Airport is serviced by national and regional airlines connecting Cairns with cities and towns across Australia. Queensland Rail connects Cairns to Brisbane and beyond via the State rail network while cross-country coaches service Cairns from all Australian States. Australia has a highly-regarded education system with all classes conducted in English. Cairns is home to world class educational institutions with two universities which regularly appear on ‘Best University’ lists. James Cook University is ranked in the top 2% of the world’s tertiary institutions. Central Queensland University enjoys a reputation as one of Australia’s most progressive and innovative universities. Students can begin their studies in Cairns through a short Study Tour, at school or at an English Language College. Further opportunities along the Education Pathway can continue with long-term study at a Vocational Education and Training College or at one of Cairns two Universities. Cairns is an attractive tourism destination attracting almost 2.5m visitors annually. The region has a diverse range of attractions and is the gateway to the Great Barrier Reef and Daintree Rainforest UNESCO World Heritage Sites. Cairns Esplanade in the centre of the city is a buzzing waterfront entertainment precinct with bars and restaurants alongside a (free) saltwater swimming lagoon set amongst landscaped parklands. Within a few minutes of the Cairns CBD you can go bungy jumping, white water rafting, take a scenic railway or a rainforest cableway. Cultural attractions include Tjapukai Aboriginal Cultural Park which tells the stories of the indigenous Aboriginal and Torres Strait Islander people with music and dance.